¡Olé! 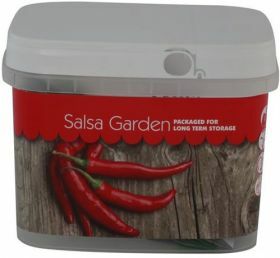 Yes, your long term seeds can contain a variety of certain items to create that perfect salsa dish. Just because you prepare for worst case scenario doesn't mean you always have to rough it. By planning ahead, you can also still have the things to enjoy life. This goes for your food too! 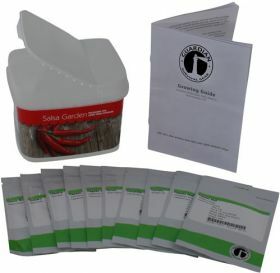 In addition to our vegetables seeds, fruit survival seeds, and other herbs packages, we have long term seeds in a bucket that has the right peppers, onions, cilantro and tomatoes you can use to create that party tray. Variety is the spice of life and you don't want things to be any more dull than they have to be after you've prepared so well. After things normalize after a collapse or just because you want to be self reliant, these preparedness seeds will help you start that new life. The Preparedness Seeds Salsa Bucket provides a missing link in your food storage plan. By storing away enough seed to plant a large salsa garden, you will be able to spice up your food storage for years to come. These seeds are Non-Hybrid, Non-GMO and are not chemically treated. Because they are non-hybrid, seeds may be harvested at the end of the growing season and then used for the next year's planting. Each of our Seed varieties comes with a Quick Start Growing Guide.